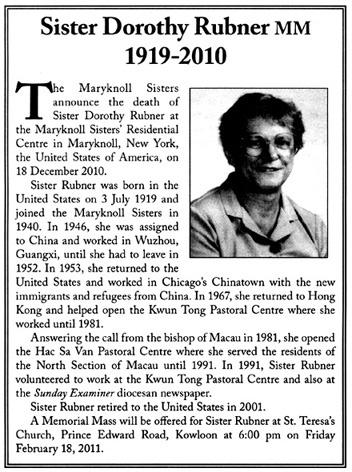 Sister Dorothy Rubner, died peacefully at the Maryknoll Sister’s Residential Care Centre at Maryknoll, New York, the United States of America, on 18 December 2010. She was 91-years-old. 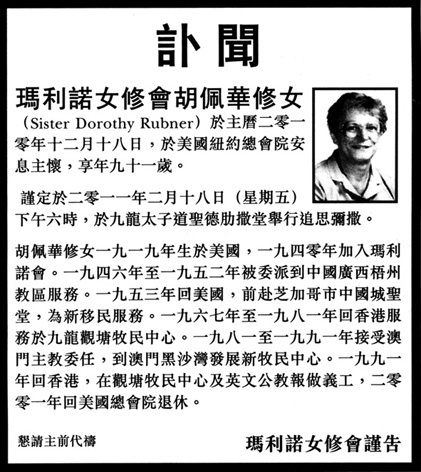 Sister Rubner worked in China, Chicago, Macau and Hong Kong, and also helped on the Sunday Examiner during the 1990s. A memorial Mass will be celebrated at St. Teresa’s Church, Prince Edward Road, at 6pm on 18 February.